Warlord Games is giving us a look at the painted up version of the exclusive White Death miniature you get when you pre-order the Armies of Italy and the Axis book for Bolt Action. We’re currently taking pre-orders for the Armies of Italy and the Axis Bolt Action supplement and as with all of our Bolt Action armies books, you also receive a free and exclusive figure if you buy the book directly from us at Warlord Games. 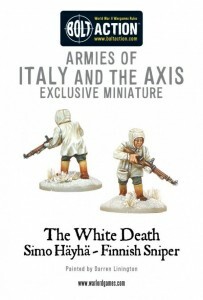 The exclusive miniature included with this book is none other than Simo Häyhä (AKA The White Death). This Finnish sniper recorded the highest number of kills in any war – 505. What makes his feat even more remarkable is that none of these were aided by a sniper scope – he fired of normal iron sights!